The Detroit Lions have had three players from their 2011 draft class arrested for marijuana possession. Maybe they have the right idea. This Lions team needs to relax. They might be the dirtiest team in the sport. Cheap shots. Near groin shots. Handshake tiffs. Brawls, temper tantrums, more fights. And that's just from a Lions walk-through. Maybe there isn't enough marijuana in all of South America to calm this team. I actually like this franchise. A lot. Very good coach, smart GM, and there is talent bursting across the roster. The Lions are potentially so good they could sneak past the obvious favorites like the Giants, Patriots and others and end up in the Super Bowl. Yes, you read that correctly. But only if this team can harness what is an amazing lack of self-control. The Lions remain one of the least disciplined teams in football. The latest incident with the team again shows that coach Jim Schwartz has yet to solve the riddle that is Detroit's inability to be controlled and coolly efficient. Recently Schwartz banned the Lions' Titus Young from OTA practices because, according to Mlive.com, he sucker punched teammate Louis Delmas. Just classic. It's not so much there was a fight. Fights happen all the time during NFL practices (even OTAs). It's that he allegedly sucker punched his own teammate. There's cheap and then there's cowardly. This was both. Young has been on the dirty radar before. When we last left the Lions they were in a playoff game against New Orleans when a series of penalties sent them off the rails. 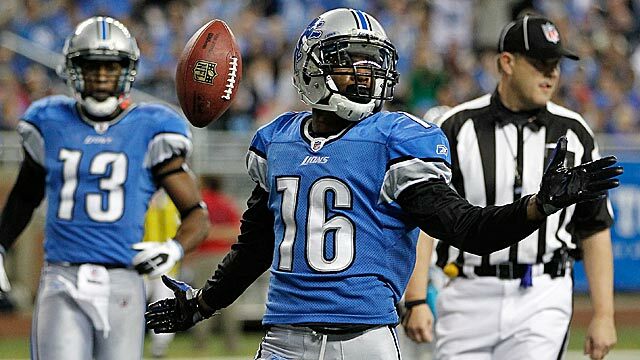 Young was caught punching the Saints' Malcolm Jenkins in the face and the Lions were penalized 15 yards. Young is apparently digressing. He's gone from squaring up with his targets to waiting until their backs are turned. And do we need to get into Kung Fu Suh? The Lions are a team on the verge of something special, but they're also totally untrustworthy. They have a smart coach who is also a hothead. The team drafts good talent that it knows could possibly implode. They do so many things right and so many things wrong. They could be great, but undercut their own future with petty acts of wannabe thuggery. If the Lions ever collect themselves and begin to behave like professionals they could be the most dangerous team in football. I've heard that several times from scouts around the league. It's not a ludicrous notion. There are division rivals hoping the Lions continue to act like little boys because the day they become men the NFL is in trouble. There's no true equivalent of the Lions in today's NFL. The closest might be the Buddy Ryan-coached Philadelphia Eagles from the late 1980s. That team was also packed with talent (Reggie White, Randall Cunningham, among many others) but drastically underachieved because Buddy Ryan could never decipher how to stop the Eagles from making numerous mental errors. Part of that problem was because Ryan was a better coordinator than he was head coach. He couldn't reach his team. Schwartz clearly isn't reaching his Lions yet, either. If Young is going all Kermit Washington just some five months after Schwartz lectured him about controlling his temper, Schwartz needs to rethink his coaching techniques. But this isn't all on Schwartz. The Lions' front office also has to re-examine how it drafts. Again, the Lions had just five picks in the 2011 draft, and incredibly three of them have been arrested for marijuana possession. At least we know this about the Lions: they can take a hit. One member of that Lions' Pot Patrol, Mikel Leshoure, has pled guilty twice to possessing pot, an embarrassing fact to be sure, but he also faces a possible six-game suspension. That's beyond embarrassing. 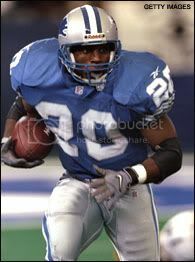 Leshoure told the Detroit Free-Press: "I put it in the past, man. I'm moving on and learning from my mistakes, and I'm going to leave it at that. Lessons have been learned." Do the words of Leshoure apply to the entire Lions team? Have lessons been learned? Those are the questions. For the moment, the Lions can't be trusted, and that distrust is well earned. But if they ever get it, this is the most dangerous team in football. Our running game and secondary is still going to be garbage. I don't see how we're going to be much better than we were last year. I agree that until our running game finds a healthy trio of backs we haven't found our niche. And the secondary didn't improve this year. Possibly took a step backwards. But I think Stafford can make us better than any RB or cornerback. The last 4 games of last year he really turned it up a notch. I think his development takes us from average to Elite. Green Bay and New England had horrible secondary's and average RB's last season. I agree with you there, and honestly, I expect our OL to be better this year, and that's going to be huge. If we can get Stafford more time to throw the ball, and a more consistent OL, he's just going to be that much better. I just think it is unfortunate that our FO didn't get us a better, more stable backfield given the FAs that were available (Bush and Hillis, but more Bush than anyone), and what they signed for. For their contract numbers I think it is utterly irresponsible that Bush and Tracy Porter aren't Detroit Lions. I think OVERALL, our team has gotten better. Not only through FA and the Draft, but through guys getting healthier also. "The Lions are dirty and/or undisciplined" story line is tired already. Courtesy of Mike Florio. He's pushed the "dirty Lions" story last year, ignoring the dirty actions of the Saints, Falcons, Steelers, and Ravens. I stopped reading PFT altogether because their articles are so superficial. Totally agree. It's gotten ridiculous at this point. every offseason every team has a fight or two durring camp. the difference is this was no contact OTA's. there really is no excuse for a physical alteration as these guys are not hitting each other. That said guys can fight and be best frends for drinks at teh bar that night. I agree it's been overblown. Guys, fights are one thing. Sucker punching someone is quite another. That plays to the absolute immaturity of Young, as well as his lack of self-control. I don't think the Lions should trade or cut him, because he has obvious talent. But they need to sink it into his head that while a disagreement or even some pushing/shoving is to be expected, a sucker punch is going to be met with a fine and suspension, as well as a drop on the depth chart. Even his agent should be contacting him and saying "WTF?! Do you NOT want a second contract in the NFL?" As such, I agree that the whole thing is just piling on by the media, but can you blame them? Other than Bountygate, there's really nothing for them to sensationalize this time of year. It would be nice if the Lions quit giving them material. It would be nice if the Lions quit giving them material. But I wonder...If this were 20 or 30 years ago, would this really be that big of news? It was a dirty move by Young for sure, but sometime I really hate all the lace that Goodell and others have added to the uniform.